Did you know that an iron deficiency can leave you feeling tired? Keep your iron levels and energy high by eating foods high in iron, such as spinach or kale, as well as foods that help you absorb iron, such as citrus fruits and garlic. 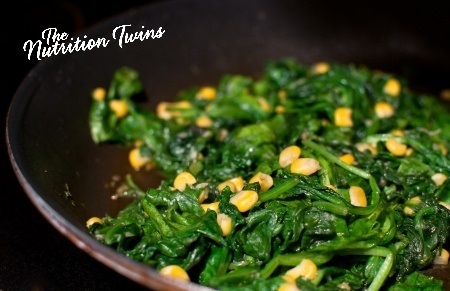 One of our favorite high-iron dishes is sautéed spinach and kale! And an added bonus – the citrus in the recipe boosts vitamin C uptake, which is a great energy booster! Heat olive oil in a sautéed pan over medium-high heat. Add onions and cook until translucent. Add garlic. Begin to add spinach and kale a little at a time, each time leaving enough room to stir. As the vegetables cook down and begin to wilt, add more. Continue until all of the spinach and kale is added. Let cook for about 7 minutes, or until all leaves are wilted. Once wilted, take off heat. Pour lemon juice on top and stir. Add salt and pepper to taste. Stir in. Top with pine nuts. If you use 1/4 cup corn rather than the pine nuts, it will cause the calories to drop about 40 per serving. For a 10-day Weight Loss Jumpstart and Detox Plan and more delicious healthy recipes like this, please check outTheNutrition Twins’ Veggie Cure!